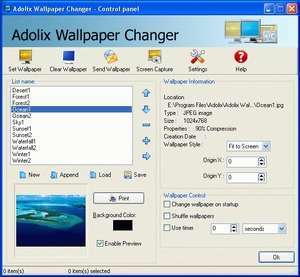 Adolix Wallpaper Changer is a free wallpaper changer and randomizer that will allow you to change background on your desktop. You can make a play list with your favourite pictures and play it all day long. Various file formats are supported and many, many options are available. For security reasons, you should also check out the Adolix Wallpaper Changer download at LO4D.com which includes virus and malware tests. Additional screenshots of this application download may be available, too.